When confronted with genetic engineering, the courts were blindsided by the application’s many, new, non-trivial techniques of altering genetic code and failed to separate those techniques from the meiotic process by which helical sentences have always been written. Those natural processes brought about the crucial replication of technically imprinted code, while furnishing the coat tails of their own mystery to those who had done the rewriting. I am keying all this in using the Roman alphabet. For a different purpose, I might write my information in the code of some computer language or even in the code of genetics. 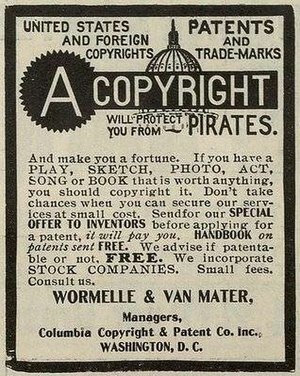 Were I to protect my originality in the first two cases, I would seek a copyright, but somehow the last case allows me access to a patent, granting me almost mythical powers. Certainly the method of placing my designed, genetic code into a reproducing cellular environment is patentable, a unique cellular environment may also be, but why isn’t the code itself subject instead to copyright laws? I only ask because—in spite of what has been done—this difference should be looked into; reverting to copyright would be a significant return to judicial intent. As might this: imagine a box of cereal with ingredients wheat, wheat, cane juice. . . ; where wheat is genetically rewritten wheat that is not being passed off as evolved wheat. Were new helices mechanically imprinted, their true nature as sentences of information, subject to copyright law, would be clear. Along with the papyrus scrolls, typewriters, and printing presses; a novel process for rewriting genetic code would itself be patentable; code that results in an apparatus*, valued for it purposeful action, would be so; but this gaffe in patent law must be undone before all of us are. * The courts allowed genetically modified organisms to swing entirely into patent law based on an application which resulted in oil consuming algae. This entry was posted in Chemistry, Economics, Health, Justice, Life science, Rights and Obligations, United States and tagged biotechnology, GMO. Bookmark the permalink. Wow, incredible blog structure! How long have you ever been running a blog for? you made running a blog glance easy. The overall glance of your web site is fantastic, let alone the content!